This has become a regular ride for WelHatCycling. Starting at Campus West at 11am we will ride to Tewin for the Tewin Orchard Apple Day. The ride will be on quiet roads, cycle paths, and bridleways which could be muddy due to recent rain. The weather should be fine but could be quite cold so bring sufficient layers. Hot drinks and cake will be available at the event and you might want to buy some apple juice, in which case bring something to carry it in. 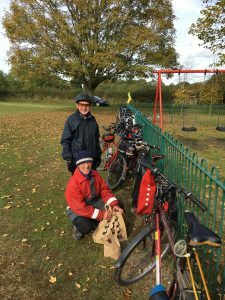 We were lucky with the weather as it had been cold wet and miserable on the Saturday but fine and generally sunny for the ride on Sunday. Only three of us this time when we set of from Campus West. We followed the old railway line under the White Bridge, crossed the mainline via the Lyles Lane footbridge and turned left to follow Lyles Lane up to Knightsfield. From there we joined the cycle track alongside Bessemer Road and made the tricky crossing to Digswell Lane, which is a dead end for cars but allows cyclists through to Hertford Road. We then joined the bridleway which runs more or less parallel to the river Mimram and made our way to Tewin Pavillion. After sampling a few of the wonderful cakes on offer, wandering a round a bit and stocking up on apple juice we headed home. All three of us were heading to Hatfield so we didn’t return to Campus West and instead went via Archers Green Lane and crossed the B1000 to follow the bridleway up a steep hill to Panshanger. From there we headed to Beehive Lane, past the QE2 and back to Hatfield via Ascots Lane. This was our last ride of the year. We plan to start up regular monthly rides again in the spring.